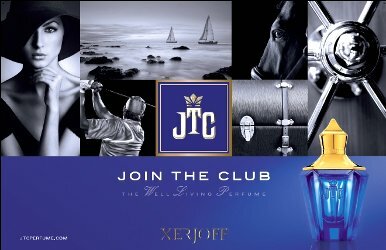 Here’s the concept: Each of Xerjoff’s ten Join the Club (or JTC) fragrances is an olfactory homage to a particular hobby. When you buy one of them, you get a code that gives you access to a website with "exclusive initiatives" about the hobby to which your perfume is linked. Golf, sailing, theater, meditation, cigars, jazz, poetry, fashion, horse racing and traveling each has its own JTC fragrance. Well. A beautiful fragrance doesn’t need a gimmick to sell it, and as soon as I read the description, my snark machine fired up. On the other hand, Xerjoff doesn’t usually skimp on materials, and although many of their fragrances are conservative to my nose, I really like a few of them. How does JTC fare? Fatal Charme: “Fatal Charm is the trendiest Club.” This, I believe, is the “fashion” perfume. Fatal Charme is a girlish iris with a bright citrus opening. The iris is powdery enough to remind me of mimosa. The fragrance smells more like a teen coquette’s boudoir than a late-night club throbbing with dance music. Fatal Charme lasts twelve-plus hours on skin and remains airy and cheerful the whole while. More than Words: “More than a Word is the all-you-need intellectual perfume, in a context of Bohemian creativity, free from boundaries, that loves playing on words and creating verses in a contemporary lyricism.” Wow! What could that possibly smell like? Oud, that’s what. A berry-topped, rose-accented oud. Again, one squirt of this one before breakfast will oud you up amply until bedtime. Kind of Blue: “Kind of Blue is the perfume of musical fascination, like the jazz notes that inspired it.” And jazz, my friends, apparently smells like a powdery floral loaded with laundry musk. If you were envisioning smoky clubs, booze and Miles Davis, think again. Imagine, instead, Julie Andrews singing as she folds stacks of fluffy baby diapers fresh from the dryer. Ivory Route: “Ivory Route is the extreme adventure Club.” When I first read this description, I thought it referred to things like climbing glaciers and deep sea diving. Then I realized it must be the “travel” fragrance, and its dry herbal-leather scent bears it out. The perfume’s aroma of expensive suitcase loaded with dried herbs morphs to amber over its first hour, and it stays amber-sweet until it fades several hours later. Shunkoin: “Shunkoin is the mystical place of rare intensity that naturally brings inner peace.” Anyone want to guess? You’re thinking incense, right? Wrong. Coconut! Coconut plus almond, really. I think it’s supposed to approximate cherry blossom, but to me it was a coconut soliflore riding a vanilla-amber-sandalwood base. Ascot Moon: “The Ascot horse races and polo games are the inspiration for Ascot Moon.” There’s nothing horsey about this fragrance. It’s loaded with saddle leather, wood, and soap. If you’re looking for a classic, manly leather that isn’t too oily, you might want to give it a try. When the leather fades, cedar and wood step up. Ascot Moon doesn’t last as long as Kind of Blue and More than Words, but it’s at least six hours durable. The Xerjoff JTC fragrances come in blue glass bottles that somehow look both deco and space age. The JTC fragrances I didn’t mention above are 40 Knots (sailing), Birdie (golf), Comandante (cigars—sadly does not smell like cigars) and Marquee (theater). If any of you have purchased a bottle and are privy to the secret club website, please tell all! A 50 ml bottle of the Eau de Parfum costs $215. For information on where to buy it, see Xerjoff under Perfume Houses. 1. You’ll notice inconsistencies in spelling and grammar — including the names of some of the fragrances — but it’s straight from the press release with no doctoring from me. “Imagine, instead, Julie Andrews singing as she folds stacks of fluffy baby diapers fresh from the dryer.” Well, now the people in the waiting room think I’m totally crazy because I already laughed at snark machine. Wish they would do a sample box — several of these sound quite nice but I’m not inclined to shell out this kind of cash for gimmicky. Interesting that the press materials still had you guessing which scent corresponded to what hobby. Tiara, first in fragrance has spray samples of this entire line. Their samples are generous enough to last some wears. They ship worldwide too, so i guess it’d be an option. That may be the sample set that the PR person sent me. If so, it’s in a very nice box with papers to spray your sample on, too. Tiara, just LOLed at that line, too! NOT in a waiting room, though, thank goodness! Just Mr. Spicebomb around to think I’m nuts, and I think he already does. . . I hope you’re staying warm and dry over there! Actually, my furnace has been out since Friday. Fingers crossed I’ll have heat by tomorrow night! In the mean time, kitties, space heaters, and Mr. Spicebomb have tried to make it more tolerable! Hopefully you have fared (faired?) better! Have you tried an electric blanket? They are great just to “prep” your bed. You don’t have to leave it on all night (but you will probably want to). Good luck! Angie–ha ha, dinner parties! I don’t have NEARLY enough dinner parties in my life! In any case, thanks for sympathies. It’s bearable upstairs, but my teeth clatter downstairs. My old house has NO insulation below the floors and it makes my toes so cold! Adding it to the house to-do list. . .
Kindcrow–my only electric blanket is 20 years old, and it makes me a touch nervous to plug it in! Might be a shocking experience! I have an old down comforter that’s gotten a lot of love this winter, in any case. School’s back in session (with a late start) today, so hopefully I’ll have a warm house to greet me when I get home tonight! A 12-hr duration scent? Wowee, I enjoy iris, but I suspect its powdery aspect might start to get on my nerves around hour six, if not earlier. It is quite powdery and quite girlish, but very pretty! I had one of the sample sets….very cool presentation: slide out drawer with cute little spray vials…..and I found not a single one of them bottle worthy…and a few not even wearable. They seemed much like good ole Sergio was a little bored, had an idea for a cool blue bottle and decided to throw a bunch of things in his cauldron…voila! a new line! sigh….no thanks….but I did an RAOK of the sample set in one of the perfume groups and the dude who got it seemed pretty excited. So all’s well that ends well. As you can tell from my mini-reviews, they didn’t blow me away, either. I’m sure the bottles are gorgeous, though. Fatal Charme was my favorite, although it wasn’t quite me. Ah ok, this answers my question! I mean, at those prices, they’d have to be, like, drawn from the Fountain of Youth for me to be interested, anyway, but if both of you are saying no thanks, then that definitely answers that! You might end up liking one or two–but then again, you might well find a fragrance you like better at a lower cost and easier to find. You might want to try calling a shop like Osswald in NYC to see if you can get samples. Does Luckyscent carry these? I haven’t looked. Oh…Parfumsraffy probably could do samples too. I was going to order these samples from Luckyscent but as my finger hovered over the order button I realized that 1) there was no way that all of them, or even the majority, were going to be worth trying (I was burned by their collection of Fueguia 1833 samples, of which at most four of the eighteen were any good), and 2) I still have samples from previous Luckyscent sample packs that I haven’t even tried yet. I’m sort of relieved to hear that my instinct was right, but oh, how I wish that instead of launching ten or a dozen mediocre scents in one go, these houses would do one or two excellent ones. I know what you mean! It’s so easy to get overwhelmed by a lot of fragrances, and suspicious that it might be a case of quantity over quality. I’m incredibly suspicious over the quality of any line that introduces a gaggle of scents all at once……it feels like throwing a handful of noodles at the wall and seeing how many stick. The very first line that Xerjoff did had several really nice/worthwhile scents…..after that it just seems they aren’t even trying. ….and when perfume gets compared to noodles, you know a perfume house really needs to rethink its approach. Although I quite like noodles! . . .
You need them to keep you warm! I like noodles too…..and I’d never really throw them at a wall (bad for the noodles. bad for the wall) …. I hesitated to even use that analogy as it wasn’t complimentary to tasty noodles…. but sometimes sacrifices need to be made for imagery. But gosh, all snark aside, I like the bottles! I like the bottles, too! As for clubs, I agree with Groucho Marx. Guess you won’t be queuing up for Club Xerjoff. Another random observation: Don’t the names Knots, Birdie, Comandante and Marquee sound very 1970s? I wouldn’t have thought of it until you pointed it out–but you’re spot on! They really do! I love a blue bottle….I know; I’m so shallow. But not even for the pretty bloo bottle would I buy (or wear) one of these. I wish I could switch the gorgeous Bouquet Ideale or Lira’s uber-tacky bottles for the pretty bloo ones….